"Under the able leadership of Rahul Gandhi, the party is definitely on an upswing across the country," former Haryana Chief Minister Bhupinder Singh Hooda said. Bhupinder Singh Hooda alleged the BJP ignored farmers' plight, a massive election issue. 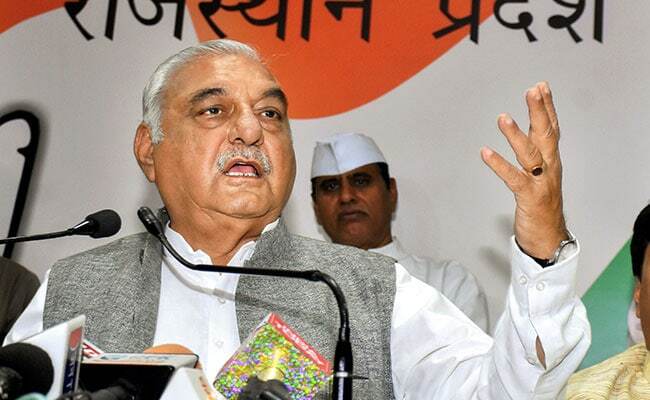 Former Haryana chief minister Bhupinder Singh Hooda on Tuesday praised Congress' performance in three heartland states-Rajasthan, Madhya Pradesh and Chhattisgarh said the election results had set alarm bells ringing for the Narendra Modi-led government. He said the Congress' performance showed that the party was on an upswing in the country. "These polls were being treated as the semi-final to 2019 (general election). The Congress' performance has been quite impressive in the Hindi heartland states. The results have set the alarm bells ringing for the BJP-led government at the Centre," Mr Hooda said. He congratulated Congress president Rahul Gandhi and UPA chairperson Sonia Gandhi for the party's impressive show in the three states where BJP had held power. "Under the able leadership of Rahul Gandhi, the party is definitely on an upswing across the country. The credit goes to him and Congress workers. The countdown for the NDA government has begun," Mr Hooda said. The senior Congress leader alleged that the BJP ignored farmers' plight, which was, a massive issue in the polls. "The government did not bother about the plight of farmers. Small traders were badly hit by GST even as Modi government's decision on demonetisation was widely criticised. Besides, unemployment was also another key issue," Mr Hooda said.